What is better in the summer than firing up the grill? 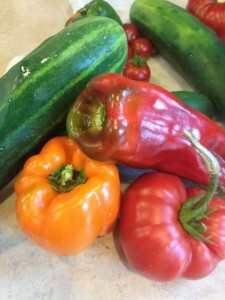 Grabbing a large bowl, harvesting some vegetables from your own garden and then firing up the grill. Why Uncle Bud’s? Because Bud turned me on to these great salmon filets. 🙂 This is a great meal that takes a half hour or less to prepare. Grilled salmons and sweet potatoes with sides of cucumber in Greek yogurt, yes yogurt, and cucumber with cherry tomatoes. Plus this is a great “Eat by Color” recipe that anyone can make. 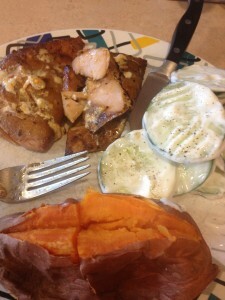 Let’s start with the sweet potato. I love potatoes off the grill. The problem is it takes FOREVER for them to cook on the grill. So I wash them, then nuke them for 5 minutes. 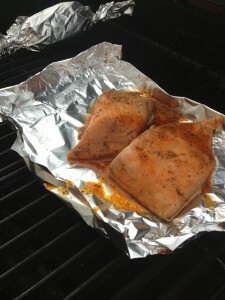 From there into some foil and onto the grill. 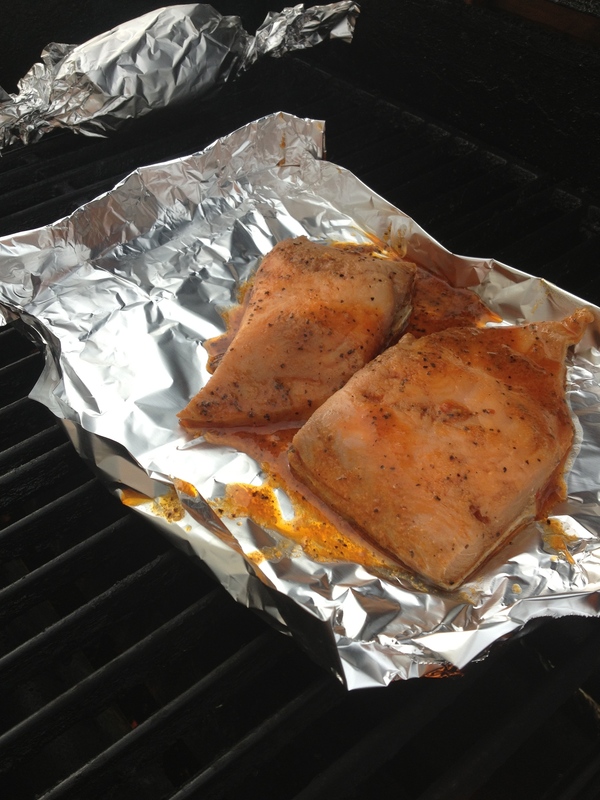 Next place the salmon on a sheet of foil and then the foil onto the grill. Note the foil wrapped potato in the back ground. The salmon I used was from one of the warehouse stores. They come pre-marinated and are great because you can pull out how many you need from the freezer, let them thaw and then cook. No need to season or anything. Grill for 20 minutes or until fish will flake with your fork. Some of the vegetables from the garden today. Notice I did not use all of them that I picked today. They made for a great pic so what the heck. Wash everything. Slice and peel if you are so inclined the cucumber. Slice the cherry tomatoes in half. 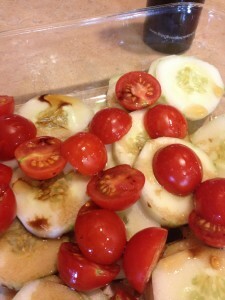 Combine the cherry tomatoes and cucumber in a bowl. Pour oil and balsamic over, cover with lid and shake. If you do not have a lid mix with a large serving spoon. Refrigerate until food comes off the grill. Take another cucumber. Slice and put in bowl. 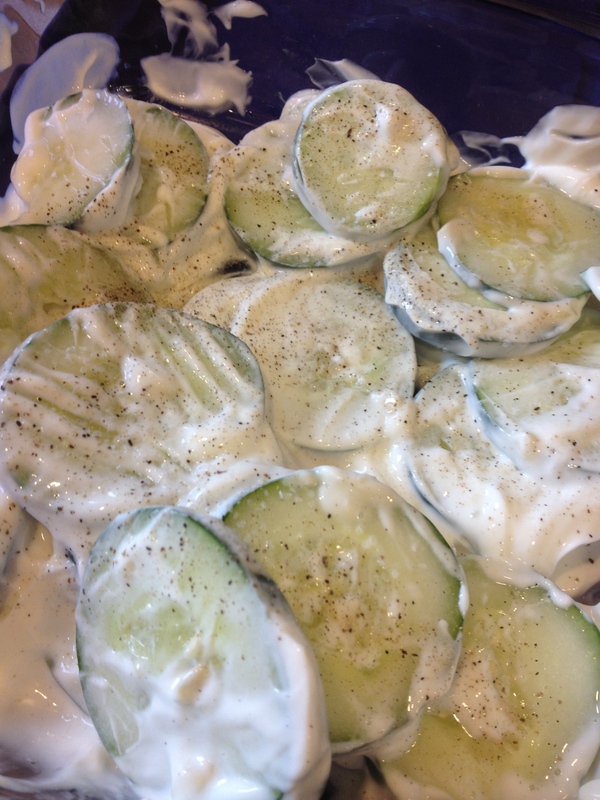 Top with 1 cup of Greek, Plain Yogurt. 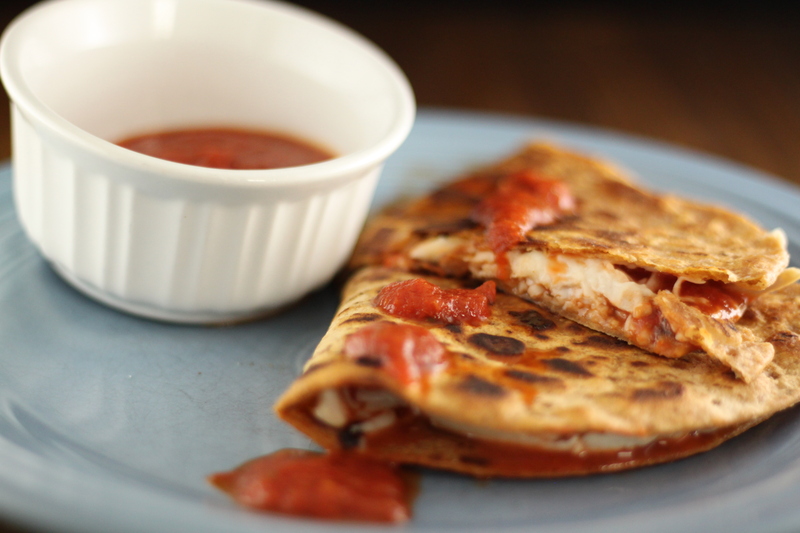 This is a great way to up the protein content of your side. It is a modern, high protein play on the old cucumber and sour cream recipe. Click the WGN 9 Logo and Get FREE Stuff! Posted in Fish Recipes, News.